This was originally published on Labour List. It’s now clear that Labour will oppose Heathrow expansion. Not only did Jeremy Corbyn say during the leadership campaign that he’d vote against it, but his Shadow Chancellor, John McDonnell, is a vocal opponent. Many Labour modernisers will be alarmed by this stance. 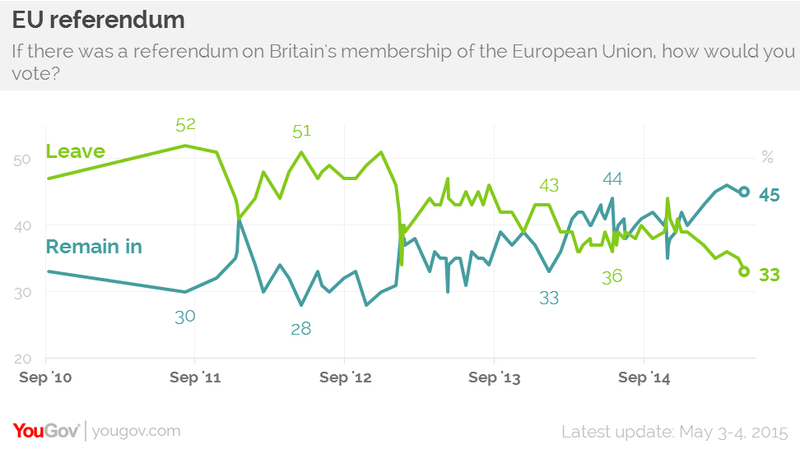 In the eyes of many, one of the top reasons for defeat in May was that the party wasn’t trusted with the economy. To win again, Labour must show it won’t undermine growth. So during the campaign, the leadership candidates most focused on winning votes from the centre presented themselves as able to regain economic credibility. When the Davies Commission recommended expanding Heathrow, Liz Kendall immediately responded by calling for a decision to build the new runway, which quickly became Party policy. The political calculation was obvious. While the Tories were split and dithering, supporting Heathrow expansion would allow Labour to outflank them as the party of job creation. The modernisers presumably considered arguments against expansion, particularly from residents who would be hit by worse air pollution and noise. This seems to be Corbyn’s main objection to it. But it’s understandable that candidates aspiring to lead the country prioritised what they saw as a national benefit over a local cost. What their calculation may not have taken into account – understandably as it was glossed over in the Davies Report and barely featured in the coverage – was whether expansion can be reconciled with the UK’s climate change targets. This is where what may seem like good politics turns out to be not only bad policy but also bad politics. The UK is committed under the Climate Change Act to cutting its greenhouse gas emissions by 80% of 1990 levels by 2050. So far we’ve done a reasonable job: we’re broadly on course and last year emissions fell by 6%. Plans for meeting the 2050 target are already generous to aviation. While emissions from the rest of the economy are due to be cut by 85% on 1990 levels, aviation’s emissions are allowed to grow by around 120%. All that emissions growth was already used from 1990 to 2005, but the plans allow for an additional increase in passenger numbers of 60%: a leniency that assumes overall aviation emissions can be kept constant as emissions per passenger are reduced with future technological fixes. This expansion will likely be overwhelmingly for leisure travel: business travel represents less than a sixth of international travel in UK airports and has been falling in both relative and absolute terms. But, unless aviation growth is limited, we will miss even this generous target. According to the Department for Transport, emissions will be well above their target even without airport expansion; a new Heathrow runway puts us still further off course. When pushed, the Davies Commission offered an eye-watering solution to meet the target. They suggested reducing demand for flights by greatly increasing the price of carbon (as well as other difficult measures). Even if planes become about a third more efficient, the Commission’s case for expanding Heathrow assumes that a London-New York return ticket should cost around £325 more than now (the range of prices they suggest vary hugely, with some much higher). The Commission’s scenario is based on optimistic assumptions about future technology, so we’d need even greater, and less realistic, breakthroughs to resolve this dilemma. So the proposal appears to be to expand Heathrow but to avoid using all of the new capacity by making flying so much more expensive it’ll again become available only to richer travellers. This means it’s impossible to be in favour of more than two out of three of: building and fully using a new runway, keeping flights affordable for poorer travellers, and meeting our climate targets. If you agree the UK should meet those targets and that foreign holidays should be available to poorer families, the policy argument for expanding Heathrow is challenging. Expanding an airport but not using the capacity is so obviously a waste of money I can only assume the Commission doesn’t really think we should meet our climate targets. Most pollwatchers think Corbyn will be somewhere between electoral trouble and a disaster for Labour. To test whether they’re right, what should we look for in the polls? We expect new leaders to get an initial poll bounce as the public compares them favourably with their predecessor (whose career – like all politicians’ – has just ended in failure) and then for their scores to drift once the negatives come out. I’ve had a look at historical polls (thanks to Mark Pack’s spreadsheet of every poll) to see how long this bounce lasts. 1) Nearly every Labour leader had a boost in the three months after they took over. 2) A few (Gaitskell, Wilson, Miliband) don’t seem to have changed views much: they got a small bounce when they took over, which gently unwound over the year. 4) …but the ones that lost support in their first three months (Callaghan, Foot) lost even more before the end of the year (the latter comparison could be bad for Corbyn). 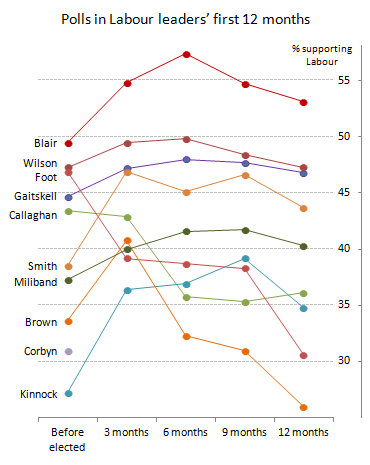 5) Every Labour leader who started with support below 40% immediately increased it by 5pts or more (except Miliband). 6) Brown really should have called that election in 2007. Clearly Corbyn’s a special case: Labour have never had a leader like him. Perhaps there’s not so much to learn from this. But if there are any parallels, I would say anything less than a 5pt boost by Christmas (ie if Labour’s on less than 36%) would be worrying, and support at Christmas lower than where it is now (around 31%) would point towards further loss of support over the coming nine months. And if Labour sees a major poll boost in the next three months, the following three to six would suggest whether Corbyn’s looking more like a Brown or a (the irony) Blair.